Get ready for game day with the best ever grilled burger recipe, these ‘Knock Your Socks Off’ Tailgate Burgers. Trust me, they’re gonna completely bowl you over with how amazing they are- appetizer, lunch, dinner- they’ll be the main event wherever they’re served. A rich and oh-so creamy mushroom sauce. Pepper jack cheese. A thick, juicy homemade hamburger patty. 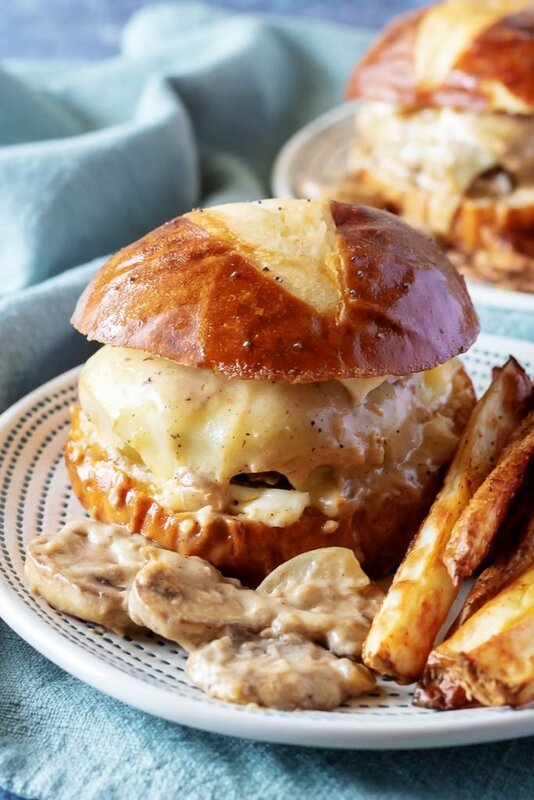 All sandwiched between a soft pretzel bun, that’s been spread with a delicious buttery, Worcestershire, poppy seed topping that’s baked right in. It’s OK, your secret’s safe with me. 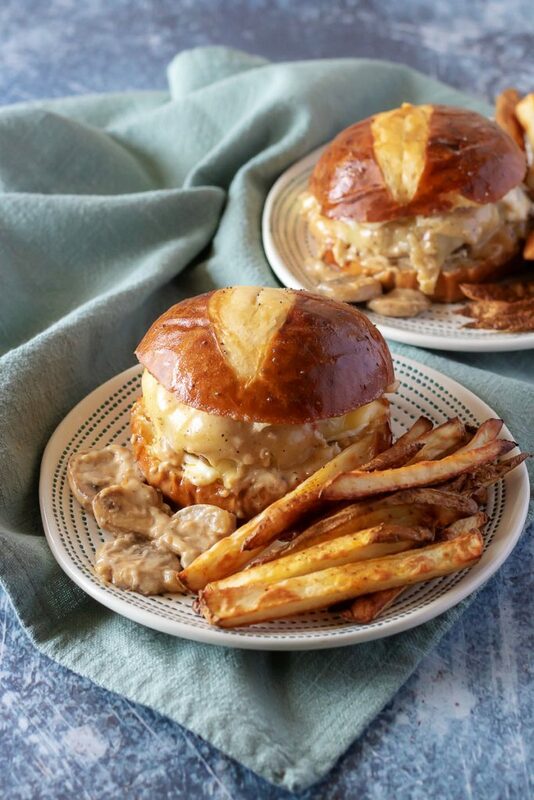 These ‘Knock Your Socks Off’ Tailgate Burgers, with their amazing mushroom awesome-sauce deserve nothing less. It’s the highest compliment this recipe could hope to achieve. That and plates licked clean. I mean I try to impress manners upon them, and stick to my motherly guns, but even I couldn’t really blame them after this dinner was done. Seriously, what more could you want in a burger? 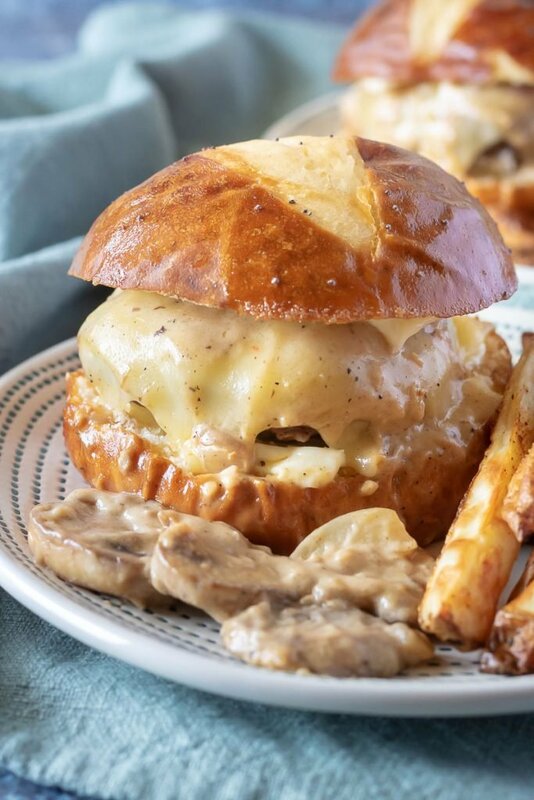 Instead of the traditional combo of mushroom and Swiss cheese, we’ve opted for a creamy mushroom sauce ladled out over juicy burgers smothered in melted pepper jack cheese. Do not stop. Don’t pass go. Run straight for the kitchen to enjoy this gift from the burger gods. This is totally indulgent and just screams ‘GAME DAY’ or ‘dude’ food. Just be careful not to indulge in them too often, or they might just ruin a burger for you if it’s served up any other way. If you’re hosting a party, these can easily be made in miniature and the slider version will be every bit as much of a hit. 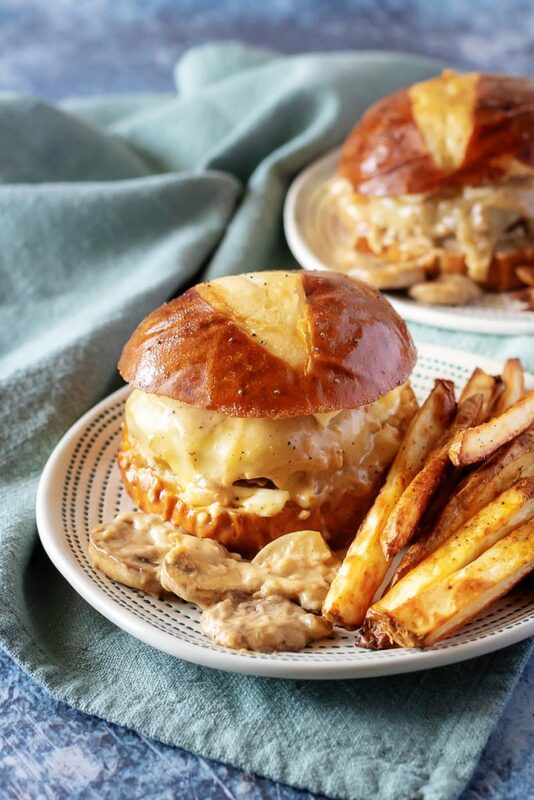 Otherwise, make these ‘Knock Your Socks Off’ Tailgate Burgers as is and enjoy while you and your guests take a big ol’ bite out of game day- grub that is. 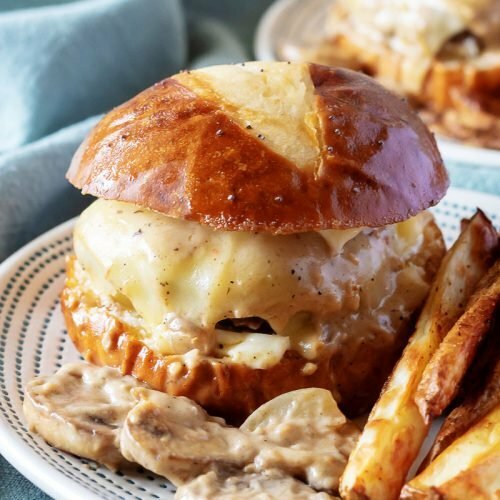 A hearty burger, this awesome version features a juicy burger on a Worcestershire and butter glazed pretzel roll, topped with a creamy mushroom sauce and smothered in melted pepper jack cheese. Divide the ground beef into 6 patties, or 12 small patties if going the slider route. In a large skillet or dutch oven, cook the patties until browned on both sides and cooked completely through. After they're cooked, set them aside, and discard excess grease. In the same skillet, melt 3 tablespoons of butter. Add in the mushrooms, onions, and garlic, and sauté until the mushrooms are tender. Add in the Worcestershire sauce, cream, broth, salt, and pepper. Bring the sauce to a boil, stirring constantly, and then stir in the cornstarch mixture. Once the sauce has thickened, remove it from the heat and set it aside. Slice open the pretzel buns and spread some mayo over the top and bottoms of each bun. Place the cooked patties on the bottom of bun and add the pepper jack cheese on top. 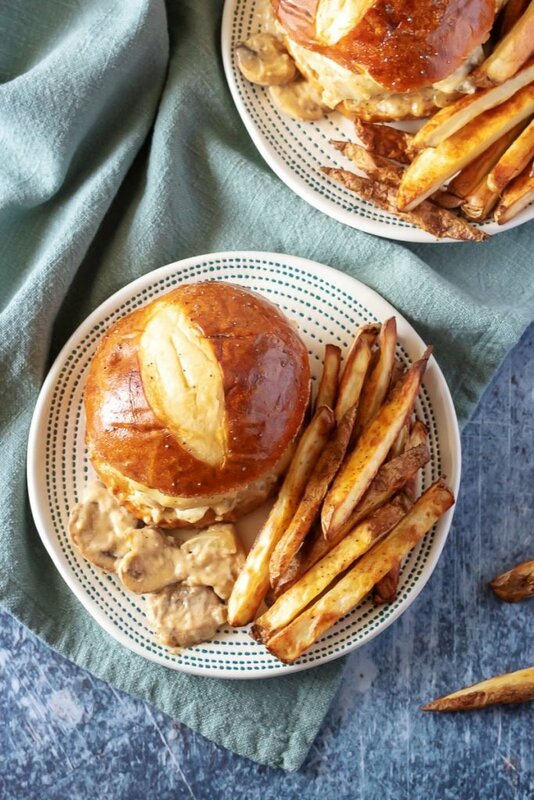 Spoon a generous amount of the mushroom sauce over the top of each patty and replace the top of the bun. Put the assembled burger in a greased 9 x 13 baking dish. Melt the 1/2 cup of butter for the topping and stir in the poppy seeds and Worcestershire sauce. Spoon the melted butter over the top of the sliders. Cover the dish tightly with foil and bake at 375 degrees for about 15 minutes. Serve hot. This looks amazing. I’ve been on a huge mushroom kick lately and this is perfect! They’re a game changer. Literally. Like I said totally an indulgent comfort food, but such a good treat, especially on those special days when you need a little extra ‘umph’! Burger and pepper jack and mushrooms, definitely comfort food. The poppy seeds are a nice touch. I think these need to be eaten over the kitchen sink! Yum. We would literally devour this! That sauce needs to get in my belly now! Yum girl! I can’t wait to give this a try! They’re amazing. You won’t be disappointed! These sound amazing and right up my alley! 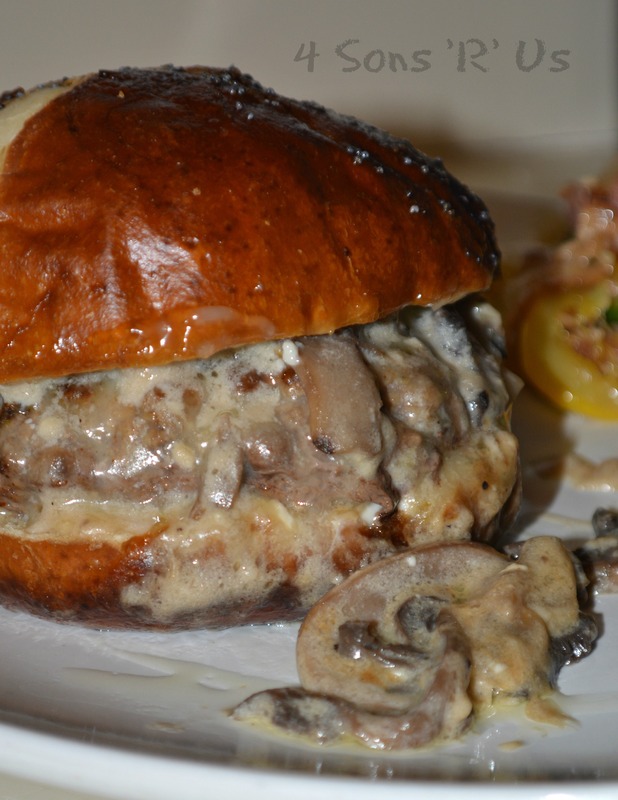 Thanks for sharing your recipe on the National Hamburger Day Blog Party.